It is important for all Coaches, Squad Managers, Captains and certified First Aiders to know which type of First Aid kits we have and where to find them. An Incident Report Form MUST be completed for EVERY incident that requires First Aid. This page contains information about the Kits and the Incident Report Forms. The Captain/Squad Manager/Coach running the first game or training session on each pitch should take the First Aid Kit out onto the pitch. When their match is finished the Captain/Squad Manager/Coach hands the kit over to the next team playing/training. 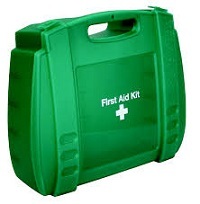 The First Aid kit should be placed in easy access of a First Aider - this is often at the closest gate to the spectators but can also be with the players and coach/manager near the players bench. Incident Report forms (see instructions below) are kept in the top pockets of the First Aid Kits along with a list of contents to assist in restocking the kits. The Captain/Squad Manager/Coach of the last team playing/training on the pitch must return it to the room before the entrance to the bar. The Pitch Side Kits have the basics needed to treat an injury at pitch side. Any after care and wound dressings should be done by a qualified First Aider in the 'snug' room ('treatment room') upstairs (in the clubhouse upstairs, the door to the left of the lift doors). There is a cupboard in the 'treatment' room which contains Steri Strips and replacement dressings and supplies to re-stock the pitch side kits. Please put back any items used from the pitch side kits. All First Aid trained persons will be issued with a key for this cupboard which is on a lanyard marked FIRST AIDER, when Adrian has seen your certificate of Qualification. You must complete an Incident Report Form (details below). If a player or visitor wishes to treat themselves they must still fill in a form and note on the form they are treating themselves. The most commonly used items are ice packs and plasters. There is a stock of ice packs behind the bar - if you ask for and use one of these you must complete the Incident Report Form. There is a box marked PLASTERS in the bar annex area - please use these plasters for general use instead of opening a First Aid kit for a plaster. Please report shortages in stock so that he can order new supplies before they run out. We have two plastic case large First Aid kits on the wall in the entrance part of the bar. These are for HSE inspection purposes only so please do not use them unless you really have to. They do not have ice packs or Steri Strips in them and are primarily for emergency use and in case of inspection. These have a red seal on then to show they are stocked and have not yet been used. We have 5 First Aid Kits for use at Away games. 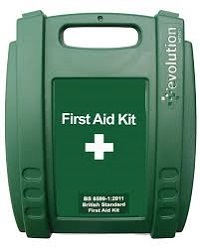 These contain very basic First Aid; they are not stocked well enough to be the Host Club First Aid kit so please use the Pitch Side kits for Home matches. 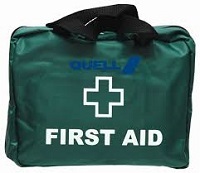 Host Clubs provide First Aid but these kits can sometimes be convenient for travelling teams. Each kit is numbered. Please return the kit to the Junior cupboard after each away Game / Tournament. Please complete an Incident Report for each incident (the forms are found in the kits) and put them behind the bar for checking and filing. If the kit has not been restocked please inform the First Aid Officer of what has been used and from which kit it has been used. ALL incidents MUST be logged and recorded on an Incident Report form - empty forms are stocked in all First Aid kits and can also be found behind the bar. NO matter how small the injury a form MUST be filled in. All details must be included on the form, including Name and Address for all incidents. Please place completed forms in the right hand cupboard in the annex to the bar area (just to the left of the door to the actual bar); there is a notice on the cupboard door about the forms. Please do not leave completed forms anywhere else in the clubhouse or near the pitch as they contain personal details. For more information or to get in touch with Adrian about the First Aid kits or any aspect of GHC First Aid, please contact the.